Stock Forecast Based On a Predictive Algorithm | I Know First |AMD Stock Forecast: Will AMD Keep Plunging? I Know First Predicts 15% Drop at the Perfect Timing. AMD Stock Forecast: Will AMD Keep Plunging? I Know First Predicts 15% Drop at the Perfect Timing. 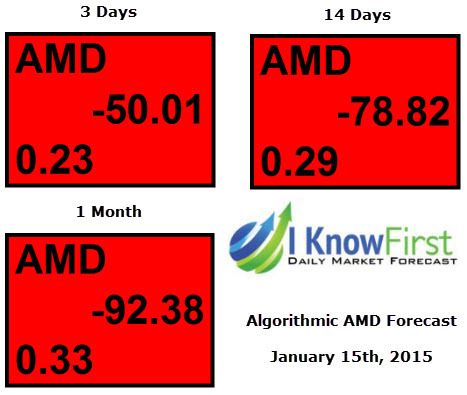 AMD Stock Forecast: On January 15, 2015, just 6 days ago, we released the article “Algorithmic Breakdown Of AMD Points To A Bearish Short-Term Outlook” on SeekingAlpha. Here is the original chart we published of the stock price before recommending to go short. We shared our fundamental research and algorithmic projections. And as always, the algorithm outperformed even our expectations of 2-6%. Here is the new price chart today. I Know First Research is the analytic branch of I Know First, a financial start-up company that specializes in quantitatively predicting the stock market. We did not receive compensation for this article, and we have no business relationship with any company whose stock is mentioned in this article.